Yes that's right! There is a roadhouse in the outback that is actually pink. Situated on the Oodnadatta Track, the Pink Roadhouse provides everything a good roadhouse should, including warm and friendly service and idea touristic photo opportunities. 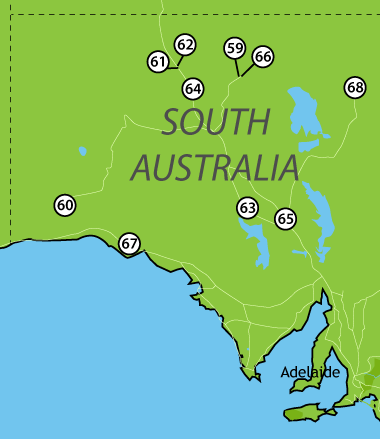 The Nullarbor is a remote area so it's best to be well prepared for the tough road ahead. The Nullarbor Roadhouse is the best place to do this, but be prepared for high prices, as this establishment's isolation calls the need for this. Break down on the highway and the kind folks at the Marla Roadhouse will come and get you. Once you arrive you will be able to enjoy a nice meal, stock up on supplies and prepare the start your journey once again. Described as 'a stop in the middle of nowhere', this roadhouse pretty much sums up what an outback roadhouse is all about. However, it is relatively close to the Mintabie Opal Fields, which produce South Australia's Black Opal so be sure to check them out. This stop is essential stop on the Stuart Highway as it is the last stop for 254 kilometres before you reach Coober Pedy. The Cadney Homestead is home to a huge dining room and bar, behind which is a sign that is you interpret, will earn you a free beer. Frequented by the cattle station locals, the Cadney Homestead is the area's hotspot and offers a great place to stay for the night. Stop by on a Sunday night for a hearty chicken or veal schnitzel and enjoy a friendly and lively atmosphere. The roadhouse is also well stocked with groceries, fuel and drinks. William Creek is a great place to stop if you want to see the inside of a true Australian outback pub. The town itself is also steeped in history and although it is the state's smallest town, it is positioned on one of the largest cattle station's in the world; Anna Creek Station. The Nundroo Roadhouse is a popular roadhouse because of its isolated location along the Eyre Highway. Essentially, it's a must if you are low on fuel and supplies, and a break from the dry dusty roads won't go astray either. Enjoy a hearty meal and an ice cold beer when you stop in at the Mungerannie Hotel. Offering a camp out, fuel, tyres and warm hospitality, you won't want to miss out on this one.